You are suffering with cough, wheezing and tightness in the chest? You may be suffering with asthma. Asthma is a chronic condition which is characterized by airway obstruction. The airways or bronchial tubes are extra sensitive to irritants and makes hard to breathe. Airways become red and swollen, inflamed inside and filled with mucus. The swelling of airways and mucus makes airways narrower leading to obstruction of airways. Asthma is a chronic illness in children and adults. It is a lung disease characterized by airway inflammation, air way obstruction and bronchial hyper responsiveness. If you have asthma, you can control and lead an active life with few symptoms. But asthma cannot be cured completely. You have to manage and control asthma to lead an active life. Managing and controlling asthma means staying from the things which triggers the asthma and taking medications and drugs as prescribed by the doctor regularly. If you don’t control asthma, symptoms become worse and you cannot go to school, office or work. You cannot do the other works at home and the things which you enjoy. If your symptoms become worse, then it is called asthma attack. During asthma attack, airway openings become narrower and less air flow through the airways due to the contraction of the smooth muscles around bronchial tubes. The muscles around your airways compress together and tighten. When airways become narrower, inflammation occurs and the airways become red and swollen. The airways are narrowed further as cells in the airways make more mucus than usual. Due to the narrowing of your airways, air cannot be passed in and out of the lungs freely and levels of oxygen in the blood decrease. All the asthma attacks are not similar; some are severe than the other. If you have a severe asthma attack, your airways will be closed so much that enough oxygen does not go to important organs. This is an emergency condition and you should not neglect this condition because people die from severe asthma attacks. Visit your doctor regularly if you have asthma. The doctor will prescribe medications which keeps your asthma attack under control. Find out what causes asthma and avoid things that trigger asthma. Asthma in western countries is more; about one in thirteen adults and one in eight kids have asthma. It can affect anyone, at any age and the rates of the disease are increasing. The major factors of asthma attack are air pollution, processed foods, centrally heated, and double-glazed houses. The symptoms of asthma attack when the airways become narrowed are wheezing or whistling noise in the chest, coughing, tightness in the chest, difficulty breathing and breathlessness. Asthma attack can occur suddenly and you can recognize the asthma attack with the signs such as itchy skin or nose, irritating cough and dizziness. By recognizing the warning signs, you can take preventive steps like drugs and medications. Asthma changes slowly in the life time. If your child has asthma, he may get out of it and it can develop in the later stage. 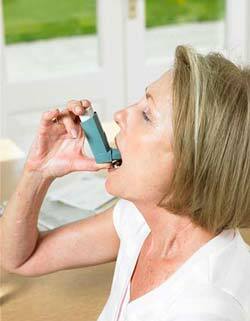 Hormones such as adrenaline and hydrocortisone help asthma. Other drugs are also there which help in removing the symptoms if you have mild asthma attack, but if you have severe asthma attack, other alternate medications are required. If you have lifelong asthma, efficiency of drugs in treating the airways reduces. Take the treatment which minimizes the inflammation in the lung airways.